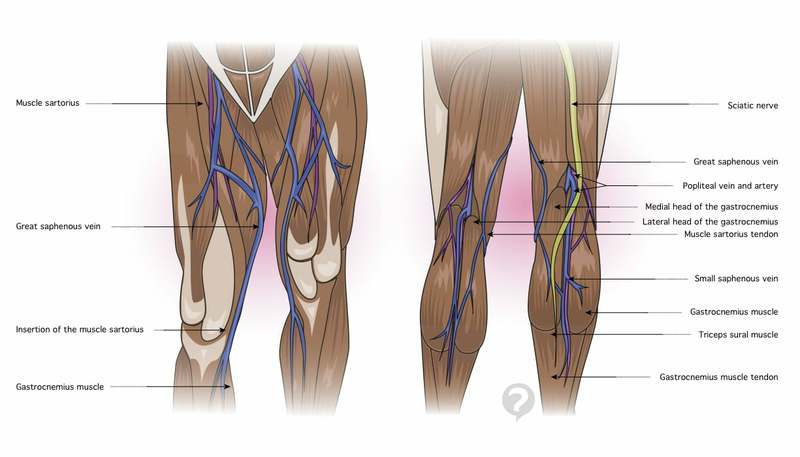 The saphenous veins are blood vessels located in the lower limbs that carry deoxygenated blood up towards the heart to be sent for reoxygenation. These veins are located in the superficial layers of the skin. 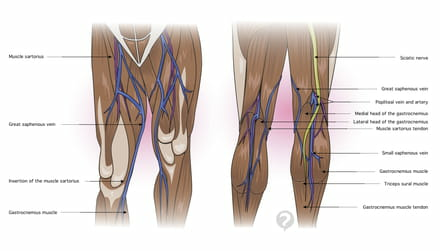 There are two in each leg: the great saphenous vein, previous called the long saphenous vein, runs up the inside of the leg from the foot to the groin where it drains into the femoral vein; and the small saphenous vein, or short saphenous vein, that runs up behind the calf muscle and drains into the popliteal vein in the back of the knee joint. These two veins are tightly linked by venules, or very small blood vessels, that interlace and connect them. They are equipped with valves to prevent blood from flowing back down the vein. If a condition affects these valves, it can result in varicous veins. This document, titled "Saphenous vein - Definition," is available under the Creative Commons license. Any copy, reuse, or modification of the content should be sufficiently credited to CCM Health (health.ccm.net).